In contrast to many national religious leaders who are lobbying for increases in immigration numbers, a new Zogby poll of likely voters who belong to the same religious communities finds strong support for reducing overall immigration. Moreover, the poll finds that members strongly disagree with their leaders’ contention that more immigrant workers need to be allowed into the country. Also, most parishioners and congregants advocate for more enforcement to cause illegal workers to go home, while most religious leaders are calling for putting illegal immigrants on a path to U.S. citizenship. The survey of Catholic, mainline Protestant, born-again Protestant, and Jewish voters used neutral language and was one of the largest polls on immigration ever done. Most members of religious denominations do not feel that illegal immigration is caused by limits on legal immigration, as many religious leaders do; instead, members feel it’s due to a lack of enforcement. Unlike religious leaders who argue that more unskilled immigrant workers are needed, most members think there are plenty of Americans to do such work. Catholics: 12 percent said legal immigration should be increased to fill such jobs; 69 percent said there are plenty of Americans available to do such jobs, employers just need to pay more. 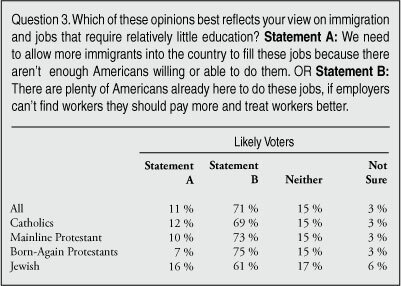 Mainline Protestants: 10 percent said increase immigration; 73 percent said plenty of Americans available. 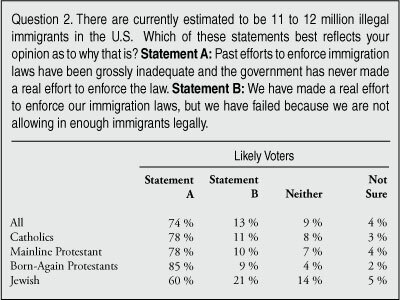 Born-Again Protestants: 7 percent said increase immigration; 75 percent said plenty of Americans available. When asked to choose between enforcement that would cause illegal immigrants to go home over time or a conditional pathway to citizenship, most members of religious communities choose enforcement. Mainline Protestants: 64 percent support enforcement; 24 percent support conditional legalization. Jews: 43 percent support enforcement; 40 percent support conditional legalization. Catholics: 69 percent said immigration is too high; 4 percent said too low; 14 percent just right. Mainline Protestants: 72 percent said it is too high; 2 percent said too low; 11 percent just right. Born-Again Protestants: 78 percent said it is too high; 3 percent said too low; 9 percent just right. Jews: 50 percent said it is too high; 5 percent said is too low; 22 percent just right. While it would be incorrect to say that a consensus exists among religious leaders on the issue of immigration, it is true that a significant number of religious leaders have expressed their strong desire to work to legalize most illegal immigrants here and increase legal immigration in the future. In particular, leaders of the Catholic Church, Mainline Protestant churches, and some born-again churches, and major Jewish denominations all have argued that we need more legal immigration, particularly more immigrant workers. The findings of a new Zogby poll show that most self-identified Catholics, Mainline Protestants, born-again Protestants, and Jews do not support these views. This divide between church leaders and members is very likely to make any debate over immigration next year all the more contentious. The positions of all the major denominations discussed below share several common points. First, based on their interpretation of their religious faiths, each emphasizes the need to treat immigrants humanely and justly. Second, while they all briefly concede that immigration limits and enforcement are necessary, they are critical of enforcement efforts and argue that enforcement in general has failed. Third, all endorse legalizing illegal immigrants with conditions. Fourth, they all share a belief that illegal immigration is caused at least in part by not letting in enough legal immigrants. Fifth, they all call for changes in policy that would increase the number of legal immigrants allowed into the country, both to join family members and for work. In particular they often mention laborers, unskilled workers, and those who do seasonal work as being especially needed. A number of these institutions have issued statements or resolutions to this effect in 2008 and 2009 — during the current recession. Born-Again Protestants. The term “born-again Protestants” refers to many denominations and unaffiliated individual churches that are generally known as evangelical or Pentecostal. In the Zogby poll reported here, it includes those who indicated they were Protestant and then answered “yes” when asked if they were “born-again.” So the results of the survey are based on self-identification, as are all the religion questions in the survey. The largest denomination that can be described as born-again Christians (and the largest Protestant denomination in the United States) is the Southern Baptist Convention, which generally does not take positions on public policy issues. The Episcopal Church also has endorsed the Interfaith Statement in Support of Comprehensive Immigration Reform that calls for a legalization of illegal immigrants and an increase in legal immigration. Presbyterians. The Presbyterian Church USA (PCUSA) has several documents on its website that indicate that one of the primary reasons for illegal immigration is limitations on legal immigration. A document provided as resource material to members on the church’s website states that it is very difficult to come to the United States legally and then goes on to say, “Faced with these severe limitations and waiting periods of five years or more, many may see no other choice but to immigrate to the United States without proper documentation.”13 Another resource document makes clear that there is a need for more legal immigrant workers and the failure to meet that need causes illegal immigration. It states, “U.S. policy does not reflect labor demands in determining caps on work visas” and “demand for worker visas far exceeds availability.” The document even states that members should “Contact your elected officials and encourage them to co-sponsor and support AgJOBS (S1038 and HR2414).” This bill would legalize illegal workers who have worked in agriculture and their family members and allow in more workers in the future to work on farms. Jewish Community. The Jewish community in the United States is very diverse and a large share of American Jews does not belong to any organized branch of Judaism. The two largest Jewish religious denominations in the United States are the Union for Reform Judaism and the United Synagogue of Conservative Judaism. Orthodox Jews are a much smaller share of the community in the United States and generally do not take public policy positions. Reform Judaism. The largest Jewish denomination in the country is the Union for Reform Judaism (URJ). The Commission on Social Action at the URJ General Assembly in 2007 adopted a resolution making it clear that limits on legal immigration were an important reason for illegal immigration. The resolution called for “legislation and policies that address the causes of illegal immigration, including legislation that: Increases the number of visas allowing unskilled laborers to work in the U.S. legally [and] Increases guest worker programs and temporary worker visas.” The URJ resolution also called for “pathways to earned citizenship for undocumented immigrants.”20 The URJ has also endorsed the Interfaith Statement in Support of Comprehensive Immigration Reform. The American Jewish Committee. The American Jewish Committee (AJC) is one of the largest and best known Jewish organizations in the country. The AJC is not a religious organization per se, but it is a leading institution in the Jewish community. Its board of governors adopted a statement in December 2006 that endorsed “a comprehensive approach to immigration reform that joins enforcement with a path to legalization, and ultimately citizenship, for the undocumented, as well as a more flexible temporary visa program that provides participants an opportunity for earned legalization.”23 In an open letter to the U.S. Senate in 2006, the AJC made it clear that there needed to be an increase in legal immigration, including “more legal work visas and more visas for immigrant families.”24 This is consistent with a public statement made earlier in 2005 supporting a temporary worker program. That statement made clear that AJC feels strongly that illegal immigration is partly due to limits on legal immigration. The statement reads, “because the immigration system does not adequately reflect our current or future labor needs, thousands of laborers are compelled to enter the country illegally.”25 Like the URJ and the USCJ, the AJC has endorsed the Interfaith Statement in Support of Comprehensive Immigration Reform that calls for a legalization of illegal immigrants and an increase in legal immigration. In fact, a very large number of other Jewish organizations also have endorsed the interfaith statement. The leaders of the religious organizations discussed above have all made clear statements that immigration laws need to be changed to allow for a legalization of illegal immigrants and increased legal immigration. However, the Zogby poll reported here indicates that most members of these religious communities have a very different point of view. Moreover, they tend to reject the argument made by religious leaders that limits on legal immigration are causing illegal immigration. Overall Immigration Numbers. Question 1 asked voters if they think the overall level of immigration is too high. (The figures on immigration levels come directly from Census Bureau data.) 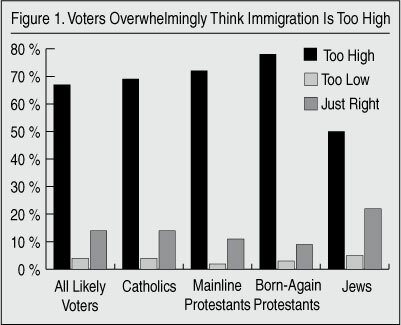 The results show that, with the exception of Jewish voters, most members of religious communities overwhelmingly think that immigration is too high. Even among Jewish voters there is a plurality who feel that the level is too high. Very few Christian or Jewish voters think it is too low. Some who advocate for increased legal immigration argue that increasing legal immigration would simply legalize an illegal flow that is already taking place. It is important to note that Question 1 explicitly asked voters to put aside legal status and focus only on numbers. So respondents should not have reacted to illegal immigration per se. Yet, two-thirds to three-fourths of voters in major Christian groups feel that the overall number is too high. Thus it would seem there is very little support for a proposal to keep immigration at the current level, but make it all legal. Of course, there is the policy question of whether an increase in legal immigration would create more immigrant social networks and thus increase illegal immigration.26 The United States legalized nearly three million illegal immigrants in the mid-1980s and legal permanent immigration is about double what it was then. Yet the last legalization and the subsequent increases in legal immigration, particularly as a result of legislation in 1990, do not seem to have slowed illegal immigration. Causes of Illegal Immigration. Question 2 gets at one of the central issues in the current debate: Is illegal immigration caused by having limits on legal immigration that are too low or is it caused by a lack of enforcement? The responses to Question 2 from members of all four religious communities indicate that they think lack of enforcement is the cause. As made clear above, the leaders of religious organizations believe that enforcement efforts have failed. Most important, these leaders feel the reason so many people enter the country illegally is that not enough people are allowed in legally. But question 2 shows that the rank and file members of these organizations disagree strongly with this point of view. 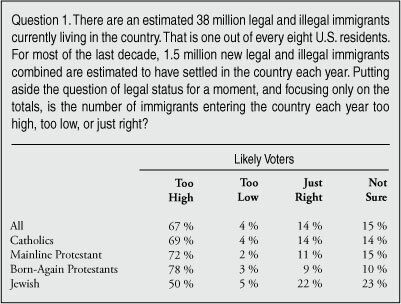 For Catholics, 78 percent said illegal immigration was due to lack of enforcement, as did 78 percent of Mainline Protestants, 85 percent of born-again Protestants, and 60 percent of Jews. Some voters did not agree with either statement in Question 2 or were unsure of an answer. But few agreed with religious leaders that illegal immigration is caused by limits on legal immigration. Need for Immigrant Workers. 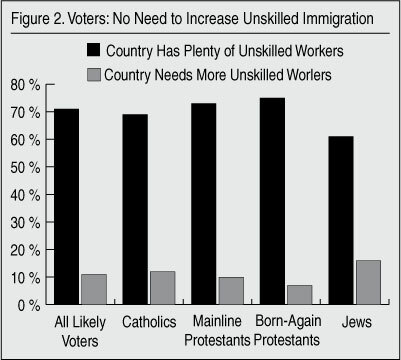 Question 3 explores one of the most important arguments made by leaders for increasing legal immigration ─ workers are needed, particularly those who are “unskilled” or “laborers.” For example, The Catholic church’s position that there needs to be an increase in legal immigration so that more “laborers from other countries can enter the country legally” is echoed by the Union for Reform Judaism call for the government to “Increase the number of visas allowing unskilled laborers to work in the United States legally.” But voters strongly reject this position, with 69 percent of Catholics, 73 percent of mainline Protestants, 75 percent of born-again Christians, and 61 percent of Jews responding there are plenty of such workers available. Legalizing Illegal Immigrants. Questions 4 through 6 examine the issue of legalizing illegal immigrants. Question 4 used neutral language and found a sizeable minority willing to support a conditional legalization when the question is asked by itself and before offering an alternative way of dealing illegal immigrants living in the United States. But when likely voters were asked Question 5, which offers the idea of more enforcement of immigration laws to cause illegal immigrants to go back home over time, many more voters pick that option. It seems that some of the large majority who support enforcement in Question 5 supported legalization in Question 4 as well. Question 6 asked the voters to choose between the two options; they overwhelmingly preferred enforcement that causes illegal immigrants to leave the United States. On Question 4, when first asked about legalization, 43 percent of Catholics said they strongly or somewhat supported conditional legalization, as did 43 percent of Mainline Protestants, 34 percent of born-again Protestants, and a majority (60 percent) of Jews. But in the case of the Christian groups, more voters said they are against legalization than said they are for it even when given no other alternative to legalization. In fact, majorities of all three Christian groups are against a conditional legalization by statistically significant margins. Moreover, of those who do support legalization, most say they only “somewhat” support it. Strong opponents of legalization outnumber strong supporters by more than a two-to-one ratio. What is so striking about this finding is that although a huge share of church leaders have embraced legalization, among church members it is a distinctly minority opinion. 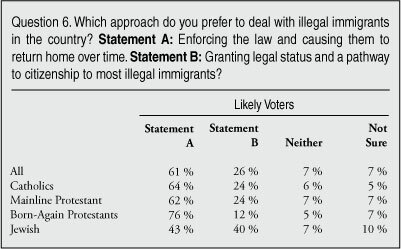 On Question 5, when asked about enforcing the law and causing illegal immigrants to go home, an overwhelming support for an enforcement approach was shown, with 89 percent of Catholics, 89 percent of mainline Protestants, 94 percent of born-again Protestants, and 79 percent of Jewish voters saying they “strongly” or “somewhat” support enforcement to deal with illegal immigrants in the country. Moreover, the intensity of opinion in favor of enforcement is very strong. Majorities of Christian voters and 50 percent of Jewish voters say they “strongly” support enforcement that would cause illegal immigrants to go home. The share saying they strongly oppose enforcement is in the low single digits for all four religious groups. Question 6 asked voters which approach they prefer, enforcement or conditional legalization, and here we see some division among voters, but not that much. Although virtually all Jewish organizations promote legalization, the poll showed American Jews to be almost evenly split on the issue, with only 40 percent agreeing with the organization’s leaders in preferring legalization and 43 percent preferring enforcement to make illegal immigrants go home. The contrast between Christians and their national leaders was even more pronounced. Only a fraction of Christians prefer the legalizations promoted by denominational leaders. Among Catholic voters, 64 percent to 24 percent prefer enforcement over legalization; for mainline Protestants it is 62 percent to 24 percent for enforcement over legalization; and among born-again Christians it is 76 percent to 12 percent. Zogby International was commissioned by the Center for Immigration Studies to conduct an online survey of 42,026 adults. A sampling of Zogby International’s online panel, which is representative of the adult population of the United States, was invited to participate. Slight weights were added to region, party, age, race, religion, gender, and education to more accurately reflect the U.S. population. The survey was conducted by Zogby from November 13 to 30, 2009. The margin of error for likely voters is +/- 0.5 percent. 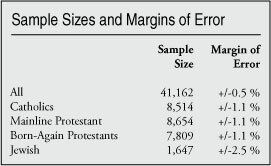 The margins of error for the four religious sub-populations in this report is shown in the table below. While we focus on all self-identified members of the four major religious communities in this report, analysis by frequency of church or synagogue attendance shows no meaningful difference in immigration opinions between those who attend often versus those who attend rarely or never. This survey of religious voters’ opinions on immigration is one of the largest of its kind. The findings in some ways are not so surprising. Voters have always been skeptical of high levels of immigration and opposition to legalization is long-standing, as the debates over “comprehensive immigration reform” in 2006 and 2007 made clear. But this survey is unique because it is large enough to allow us to compare the views of members of specific Christian and Jewish communities to leaders in those same communities. The overall findings are stark. While religious leaders think there are not enough immigrant workers legally allowed into the country and legal immigration needs to be increased, members hold the opposite view. 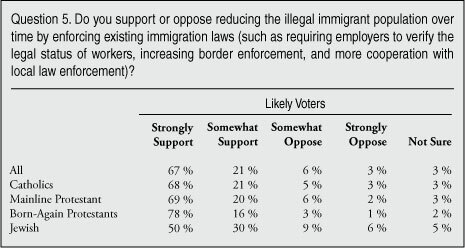 Members also feel strongly that limits on legal immigration are not the cause of illegal immigration. Rather, strong majorities of Christian and Jewish voters feel that lack of enforcement is the reason there are so many illegal immigrants in the country. One of the biggest points of contention between religious leaders and their members is on the issue of jobs. Religious leaders sympathize strongly with employers who want access to more immigrant workers. The public statements of leaders make clear that they would like to increase immigration and give employers access to significantly more legal workers by increasing immigration levels. The religious public, in contrast, feels strongly that if employers have trouble finding workers they need to pay more and treat workers better rather than bring in more legal workers. In the public’s view, the solution to recruiting and retaining workers in a tight labor market is to make jobs more attractive. But this solution does not seem to have occurred to Christian and Jewish leaders. The position of religious leaders is puzzling because there is a large body of research showing that, even before the current recession, wages and employment rates have generally declined for less-educated and younger native-born workers.27 This is strong prima facie evidence that there is no shortage of workers; if there were, wages and employment should have been going up. The deterioration at the bottom of the labor market in recent decades does not seem to have entered into the views of religious leaders as it relates to immigration. The religious public, on the other hand, appears to be aware of this deterioration, at least intuitively. Church leaders, perhaps because they identify strongly with the plight of illegal immigrants and people in other countries who wish to come here — and do not themselves face foreign job competition — do not see things this way. Leaders also seem to identify strongly with employers, repeatedly citing their arguments that there are not enough workers willing or able to do jobs that require relatively little education. Members of religious communities on the other hand seem to identify strongly with American workers. 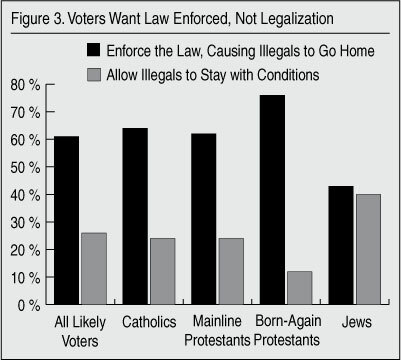 When it comes to the issue of legalizing illegal immigrants, rank-and-file Jews and Christians also disagree with their leaders, with many more wanting the law enforced and illegal immigrants to go home, than those wanting legalization for illegal immigrants in the country. The public statements of Christian and Jewish leaders make it plain that they believe that legalization is the only moral option. In contrast, their members seem to feel that enforcing the law and causing illegal immigrants to return home is the best option. Presumably community members see enforcement as moral in a way that leaders do not. The huge divide between rank-and-file Jews and Christians and many of their leaders is actually not that surprising. Prior research shows a very significant divide between opinions of the public and of elites on the issue of immigration.28 Religious groups follow this same pattern. Because religious communities often do not represent the public policy views of their members, if there is a full-blown immigration debate next year, it will be all more contentious. Jewish and Christian leaders will line up on one side of the issue and their members and the general public will be on the other, with elected officials in the middle. 1 The statement can be found at http://www.interfaithimmigration.org/wp-content/uploads/2008/10/interfai.... Among the signatories are national agencies of the United Methodist Church, Episcopal Church, Presbyterian Church (USA), Lutheran (ELCA) Church, Union for Reform Judaism, and the American Jewish Committee. While the U.S. Conference of Catholic Bishops is not listed and has not signed onto the statement, Catholic Charities USA is listed, as are several other Catholic organizations. 7 The U.S. Conference of Catholic Bishops website has a section entitled “Justice for Immigrants,” which can be found at www.usccb.org/jfi/bishops-call.html. The bishops’ January 22, 2003, pastoral letter, “A Pastoral Letter Concerning Migration from the Catholic Bishops of Mexico and the United States,” provides a detail explanation of the church’s opinion on immigration. 4 The NAE home page states that more than 40 denominations are members. The sites lists the 13 denominations that endorsed the immigration resolution here: www.nae.net/immigration-2009-endorsements. 5 The 2009 resolution can be found at http://www.nae.net/resolutions/347-immigration-2009. 6 For a general description of the mainline churches see http://en.wikipedia.org/wiki/Mainline_(Protestant). 7 See 2000 statement, at http://archives.umc.org/interior.asp?ptid=4&mid=1062. 9 The church for, example, has endorsed a postcard campaign in support of reform that would increase legal immigration; see http://www.episcopalchurch.org/79901_116875_ENG_HTM.htm. 11 Resolution B006, “Immigration: Economic Justice implications,” at http://gc2009.org/ViewLegislation/view_leg_detail.aspx?id=961&type=Final. 12 The text of the ELCA position on immigration can be found at http://www.elca.org/~/media/Files/What percent20We percent20Believe/Social%20Issues/Resolutions/FINAL_SPR_Immigration_Unformatted.pdf. 13 See resource materials provided by PCUSA, at: http://www.pcusa.org/immigration/pdf/comprehensive.pdf. 14 Telephone interview, December 15, 2009. 15 The 2006 resolution can be found at http://www.pcusa.org/immigration/pdf/immigration-resolution-2006.pdf. 16 The briefing can be found at http://www.ucc.org/ourfaithourvote/immigration.html. 17 The statement can be found at http://www.ucc.org/synod/resolutions/immigration-final.pdf. The statement is clear that it should not be an “employer focused” program and should protect worker rights. 18 The link to the Interfaith Immigration Coalition can be found on the immigration page of the UCC web site under resources, at http://www.ucc.org/justice/immigration. 20 The resolution can be found at http://urj.org//about/union/governance/reso//?syspage=article&item_id=1917. 21 The statement can be found at http://www.uscj.org/Comprehensive_Immigr6880.html. 26 For a discussion of the link between legal and illegal immigration, see “Two Sides of the Same Coin: The Connection Between Legal and Illegal Immigration,” at http://www.cis.org/node/263. 27 For a summary of recent trends in wages and employment before the current recession, see recent congressional testimony, at http://www.cis.org/node/1582. 28 See “Elite vs. Public Opinion: An Examination of Divergent Views on Immigration,” from the Center for Immigration Studies, at: http://www.cis.org/ElitevsPublicOpinion-ImmigrationViews.